I like old buildings. In particular, brick houses from about 1900-1940 just delight me; Pittsburgh has gobs of those! It also has more square footage of “green” buildings than any other city. I like forests that enclose me with green lushness. On the prairie I always feel insecure, as if I’m about to be swooped on by a hawk. I like the way the forest grows into the city wherever it gets a chance! I’m in a very urban area, but my back yard is filled with earthworms and populated by birds, squirrels, salamanders, and a groundhog (for a while–I guess she saw her shadow and moved on). I like hills, and I love the way Pittsburgh buildings and streets and steps climb the hills, as if the built city is some sort of determined ivy. There are so many more places in a square mile than there could be in flat terrain! Pockets of wilderness are left wherever it’s too steep to build. Some houses sit on lofty perches, and some have walled gardens carved into the hillside rising behind them, and some have both. Standing in the middle of my house, even though my street is narrow and the yards are small, what I see out the front windows is just snowy hillside because the houses across the street are a full story higher than mine; through the back windows, I look across a valley at the houses perched on the next ridge, two blocks away. I have to go down to the basement to reach my back yard, but it’s at the top of a three-story cliff. This topography makes everyday views and perspectives very interesting. I like public transit. The town where I grew up didn’t have any, and Tulsa and Oklahoma City had struggling systems that were barely worth trying to use. 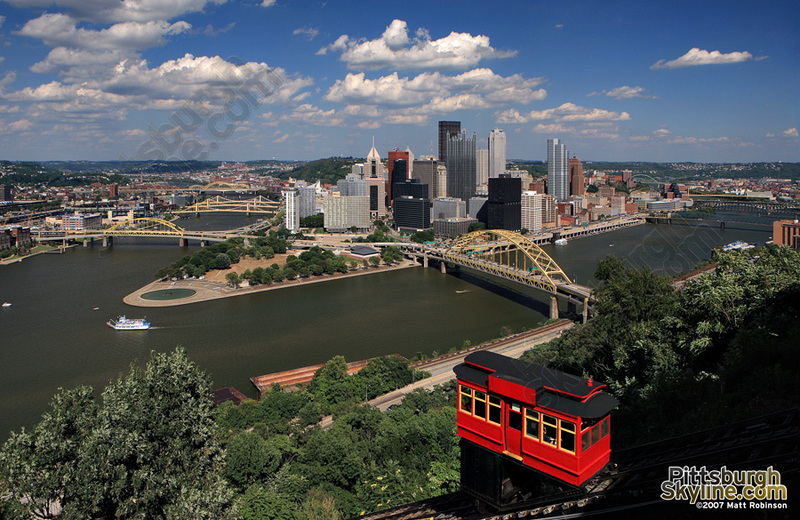 Pittsburgh’s transit system always has room for improvement, but it’s pretty good. I like the way bus drivers and passengers say, “Thank you,” to each other. I like riding buses with a variety of people, most of whom are friendly and considerate, and I love not having to remember where I parked the car or spend much time in parking lots! The inclines are totally cool. I like having four distinct seasons. Winter is a bit long for my tastes…but at least the snow here is fluffy and falls downward instead of sideways! I like the way city services and citizens get on with things in all but the most extreme weather conditions. My kitchen window looks down on a major street, and it’s a rare day when I can look out the window for five minutes without seeing pedestrians–they may be slogging through knee-deep snow, wiping sweat from their brows, or shrieking and holding onto their hats, but they’re walking places! I like the big city parks and the fact that there are people actually using the parks. When I was a kid, we often visited our local parks but usually found no other kids there to play with. I like the way the Post-Gazette tells about local happenings in minute detail. I like the fact that they always print my letters, and that when they do strangers look me up in the phone book and call to agree with me. Yet it’s not a small enough town that the letters to the editor are constantly from the same people. I like living in a place where no one religion dominates everything. Yeah, there are some streetcorner evangelists in my neighborhood, but they’re Jewish ones, and if you tell them you’re not Jewish they don’t attempt to proselytize you (and only once did one of them holler after me, “Well, where’d ya get that nose, then? !”), and their klezmer-blasting menorah-mobiles are really kind of amusing. I like being in a city that’s just big enough to have a group for almost any interest imaginable, but small enough that I feel visible in the group and often see people I know from other groups. Church of the Redeemer, a very friendly and caring Episcopal congregation. Happy Valentine’s Day, Pittsburgh! Redd up your self-esteem n’at! ← The Yogurt of Christ?? ?